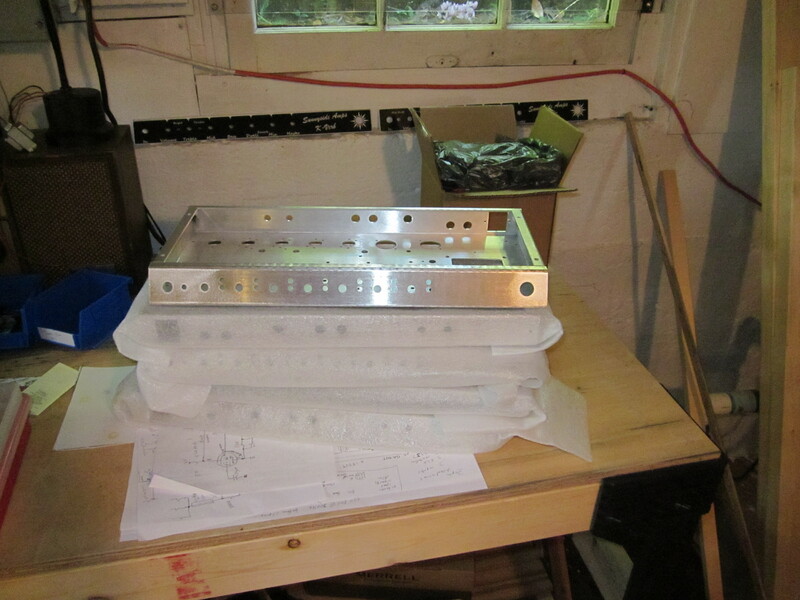 Wow, this weekend..so busy ..several amps in for repair. 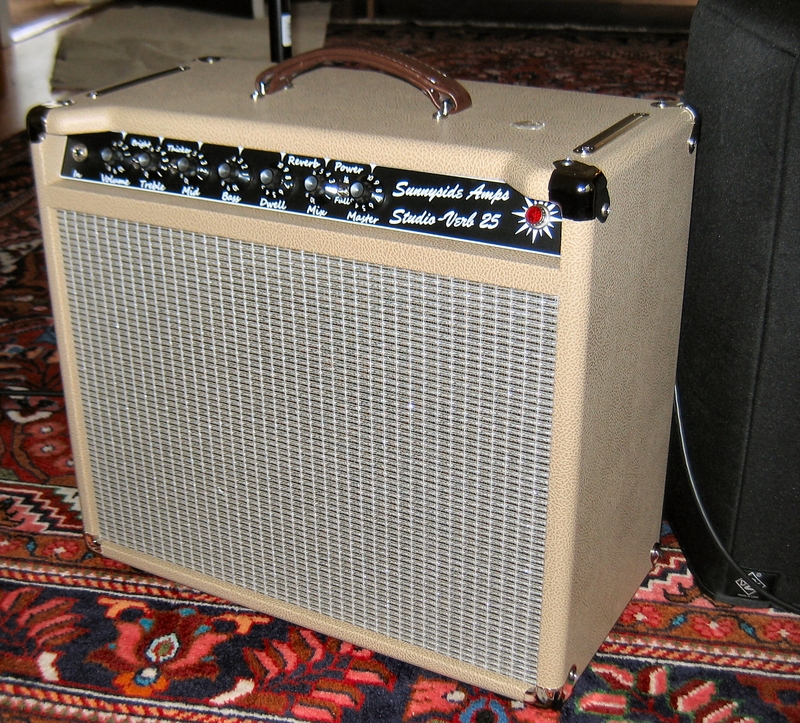 A Fender Deluxe Reverb re-issue (making crackling sounds), a Blues Deluxe (making crackling sounds!) and a Fuchs modded Deluxe Reverb re-issue making some unwanted distortions. 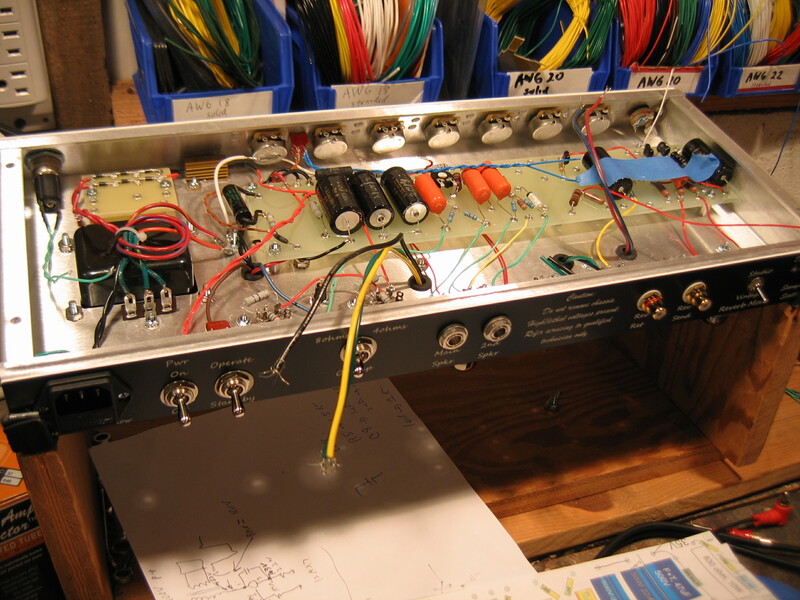 In the midst of these repairs I am in the middle of building the first prototype of what is to be a new Sunnyside Amp model. It’ll be 20-25W or so, with a beautiful clean tone, a 1×12 combo that’ll be slightly smaller than the current K-verb combo cab, and with possibly a couple of new features. I was thinking of calling it the “Studio Verb” but some have mentioned that that name makes it sound as if the new amplifier is only for the studio and not live use. But this is not the case, this amp will be a great amp to play live with, just less headroom than the 40W or 50W K-Verbs. so, I may need to dream-up a new name! Vintage pots have a different taper than newer pots. 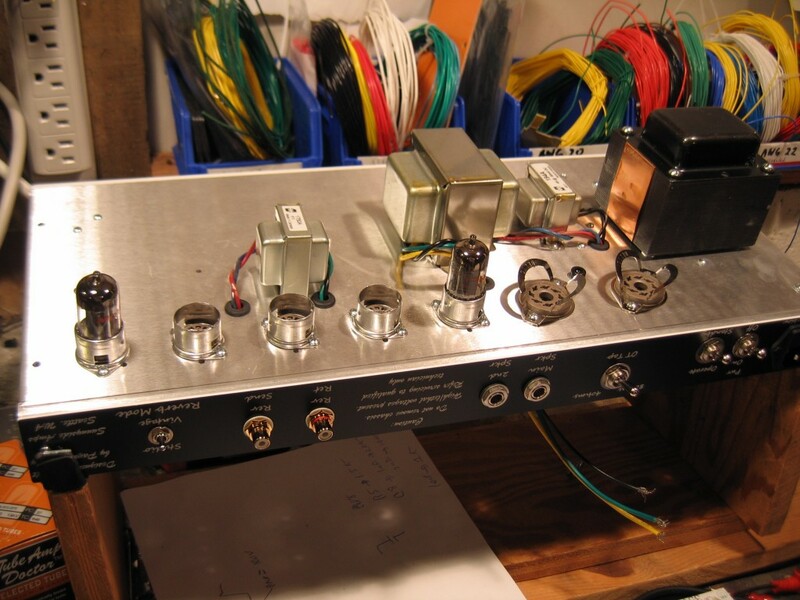 For example, on, say, an old Fender Blackface amp (with original pots) turn the volume pot to halfway and the pot passes roughly 30% of the signal through it. Newer CTS and Alpha pots , if turned to halfway, pass about 10% of the signal through it. Lets say the volume pot on your Blackface super reverb fails and needs replacement. You might perceive the amp as having less power because now you have to turn the volume to 6 where you might have only turned it up to 3 or 4 previously. I have found that this has a pychological effect on many players. That is, if the volume control needs to be turned-up to 6 the amp “seems” to have less power than an amp where you only have to turn the volume to 3. What is needed here is to actually listen to the amp to see how loud it is and how clean or distorted it sounds, and try to forget about the numbers. Set the controls for what you hear! After a year of experimentation,prototyping and refining, the Sunnyside K-verb 40 and 50W amplifiers are ready…and they sound great! If you like beautiful clean tones, reverb, and an amp that takes pedals well, then you will love these amps! Just pick the one with the right wattage for your needs are you will have years and years of great tone! 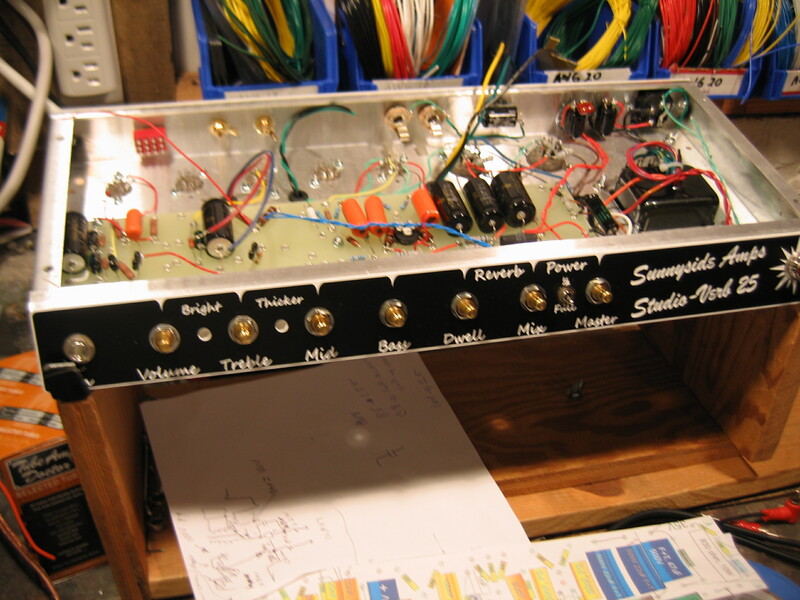 You go out and purchase a brand new, inexpensive guitar amplifier with cost-efficient PCB constructiion. It seems, at first, to be a great deal! A new guitar amp, with channel switching, and reverb, for less than $1000! Unfortunately the manufacturer cut corners and used inexpensive construction techniques that are easy to mass-produce, and keep the selling price low. But, wait till you have to fix the amp (and you surely WILL have to fix it often)–your repaitr costs will be quite high due to the more time-consuming nature of having to repair these amps. In many, if not most, of these new amps, the solder joints are on the underside of a printed circuit board, and to get to those points to enact the needed reapirs requires a time-consuming partial dissassembly of the internals of the amplifier. So, the “great deal” you thought you had ends-up possibly costing you more (due to labor costs) than if you had bought a higher quality amplifier in the first place. A lot of vintage amps have a two-pronged power cord. Here is my position on this: If you bring in an amp to me with a two-prong cord I am going to insist that you have me install a properly grounded three prong cord. Here’s why: In the case of a two-prong AC cord, in the advent that the 120V AC wire gets loose inside the amp and rests against the metal chassis, it will make the chassis of the amp possibly lethal (and at the very least increbibly painful and injurious) to touch. With a properly wired three-prong cord the above scenario (the “live” wire getting loose inside the amp and touching the chassis) would short the 120V AC wire to ground, and blow the amplifiers main fuse. Fuse blown, nobody hurt. That’s because the chassis (due to the new three prong cord) now has a direct connection to ground (earth) provided through the third prong. I take keeping my fellow musicians safe seriously! nervous if we say you need a cap job!